Like other students across the country, students at North Carolina’s public universities have seen state support reduced and tuition increase since the Great Recession. Yet because of North Carolina’s tradition of generous state support, state funds here remain almost $2,000 more per student than the average across the nation – and tuition at our public universities remains among the lowest in the country. It’s also noteworthy that state universities didn’t pass along the full force of budget cuts to students: While state appropriations declined by $2,218 per student over seven years, average tuition increased by just $1,252. 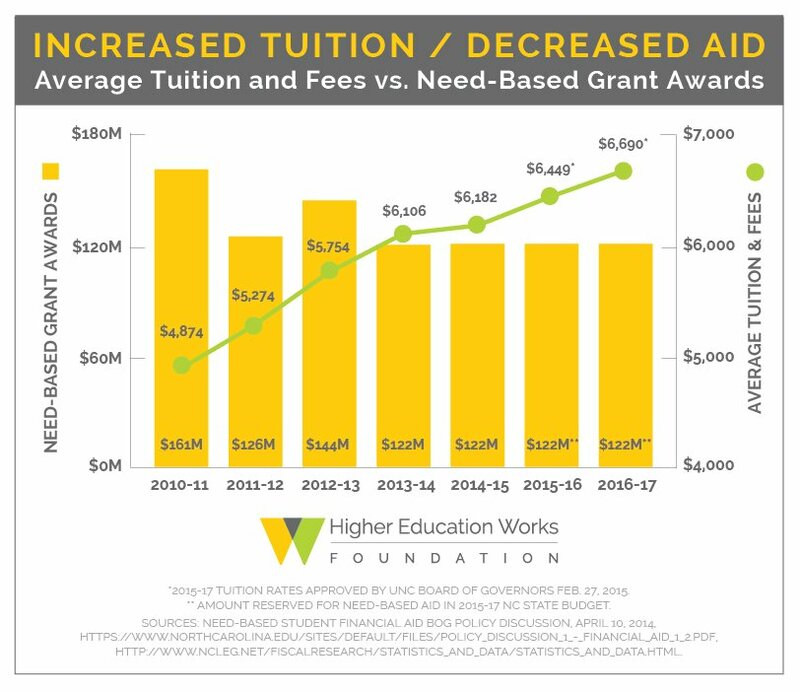 Spending cuts and higher levels of giving at most institutions augmented tuition revenues to fill in the funding gap. By definition, that means students must take on more debt to pay for college – or worse, not go to college at all. The flagship campus at UNC Chapel Hill has built resources to limit the debt of its graduates, when adjusted for inflation, to the same level it was 15 years ago3 – a remarkable achievement in an era of rapidly escalating student debt. But that’s not the case across the rest of our public universities. 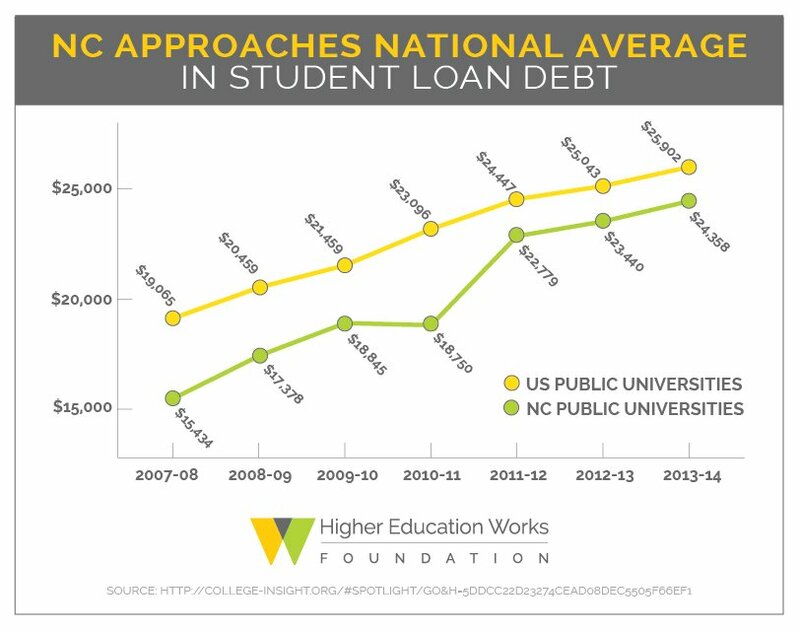 Paralleling the increases in tuition, the average debt for graduates of North Carolina’s 16 state universities has climbed and approached the national average. Yet despite that increase, average debt for graduates of our public universities remains about $1,500 below the national average. Debt can be an albatross for young people – not only do they feel the burden of monthly payments, but it can keep them from buying that first car or house and further fueling our state’s economy. College graduates benefit all of North Carolina, whether through higher wages, better health, engaged citizenship or reduced government dependence. But debt can keep them from sharing their economic energy with the rest of the state. So by several key measures, the support North Carolina shows for its public universities distinguishes it from other states – we should be proud of that and sustain it. That support benefits both individual students and the state itself. But some trend lines are worrisome, and we must be vigilant to protect North Carolina’s advantage.